Kidwelly is an imposing monument of Norman power. It is also a beautiful example of castle development, as the castle was altered on a number of occasions to conform to the latest ideas in military science. Roger, bishop of Salisbury, the justiciar of England, established Norman power in the area and the ringwork castle that he built here was one of a series of strongholds designed by the Normans to secure the new conquests of south Wales by commanding the river passes here and at Laugharne, Llansteffan and Loughor.. The ringwork at Kidwelly was constructed on a steep ridge overlooking the River Gwendraeth at its upper tidal limit. No further strengthening was needed on the riverside, and the present semicircular bank and ditch formed the 12th-century defences which would have been supplemented by a timber palisade on the bank, probably further strengthened by towers and certainly by a gate. In the interior would have been the timber domestic buildings of the lord. This castle fell to the Welsh on a number of occasions in the late 12th and early 13th centuries, including once in 1159 when the Lord Rhys took it and burnt it. He is later credited with rebuilding the castle in 1190. By 1201, however, it was back in Norman hands and remained English from then on, despite periodic attacks. After the Norman Conquest a beautiful princess from the House of Gwynedd was married to Gruffydd, son of the soil and natural heir to South Wales. 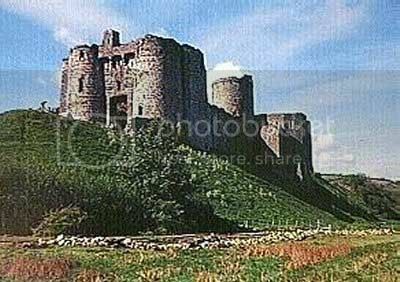 The Welshman's power was threatened by the Norman lord of Kidwelly Castle, so Gruffydd went north with his eldest son to raise support. His wife, Gwenllian, and their two youngest sons remained at home in the Tywi Valley. One day a messenger arrived: ships had been seen near the coast of Glamorgan. Soon English soldiers were marching across country to join their French allies at Kidwelly. There was no time to call back her husband, no time for advice, no time to lose. The princess donned a light coat of mail, put a helmet on over her long hair, and reached for a shield and sword. Then, riding a Scottish pony, Gwenllian led out her sons and a small army into the path of the English troops. On a high bank above the river Gwendraeth Kidwelly Castle overlooked the flat sea marshes. Creeping beneath its round towers, the Welshmen stole upriver and camped under the protecting brow of Mynydd y Garreg. Gwenllian sent half the party ahead to intercept the enemy whilst the rest stayed with her, silent and hidden. For one day they waited and nothing happened. Another day passed, and all was still. Unknown to the princess a Welshman, traitor to his country, had met with the English force and led them along secret paths to the top of the hill. In one mad moment they swept down from above onto the idle Welsh below. At the same time the castle gates opened: Maurice de Londres, the Norman Lord, dashed out on horseback, followed by his well-armed men. There was no hope for Gwenllian, though around her all fought couragously. One son, Maelgwyn, was killed fighting to defend her, and many others were quickly slain. Before long the princess and those of her men who survived were taken captive. She was wounded and helpless but even so de Londres had no pity. In front of the cheering Frenchmen her remaining son, Morgan, was held back as his mother was beheaded. For many years afterwards the headless ghost of the princess could be seen, walking in the field of battle which still has her name today. And in the legends of Wales the memory of Gwenllian, a brave and beautiful lady, lives on. i would love to visit here.whats the name of the nearest town so i can try and find it on the map please.